Since 1990, drivers have relied on the Hyundai Elantra as a practical, affordable car. While it still offers fantastic performance for a modest price tag, it now comes loaded with a bundle of new technology and features. The 2019 Elantra has received numerous upgrades, now outfitted with new safety, entertainment, and navigation tools. The compact car promises all this with incredible value, bolstered by the Hyundai warranty, one of the most comprehensive powertrain warranties available. The Elantra offers class-topping interior space, and it’s an easy ride on city streets and highways. If you’re looking for a convenient compact for your commute through Sycamore or a vehicle that can remain comfortable even on long trips, Sycamore Hyundai is ready to help. Drop by our dealership today to test drive the 2019 Hyundai Elantra. The Elantra holds five and comes with two full sets of LATCH connectors to accommodate car seats. Soft materials make for a comfortable commute, and adults will have plenty of elbow room in the front or back seats. The Elantra’s cargo space stands out in its class, with 14.4 cubic feet of storage in the sedan’s trunk, and 55 cubic feet available in the hatchback when its rear seats are folded. Steering is responsive and the compact takes twists and turns with ease. Drivers have a few engine options to pair with a six-speed automatic transmission, from the standard 147-horsepower 2.0-liter to a 201-horsepower turbo 4-cylinder. Conservative fuel economy adds to its budget-friendly value. 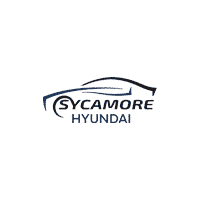 At Sycamore Hyundai, we aim to put you in the best position possible when shopping for your next sedan, truck, or SUV. We have new and pre-owned Hyundai vehicles across a broad range of models, trim levels, and price points. Come to our dealership or check out our stock online to browse at your convenience. We’re confident that you’ll find the Hyundai that’s right for you, and our expert staff is standing by to help you with outstanding customer service and expertise. The Elantra delivers an amazing value, but our special offers can make the price you pay even lower! When you visit us, make sure to ask about financing plans and other incentives.